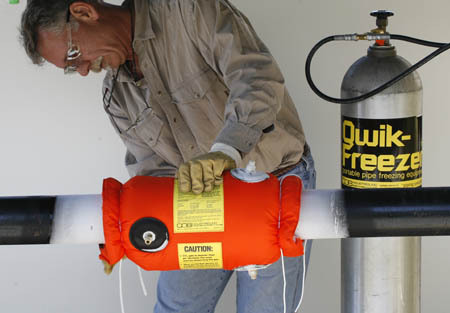 Qwik Freezer pipe freezing kits utilizes liquid carbon dioxide (CO2) to freeze stationary water in selected sections of pipe or tubing. 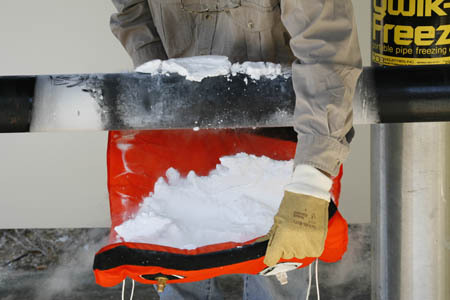 By producing very low “dry ice” temperatures, Qwik Freezer pipe freezing kits form a secure in-line ice plug. 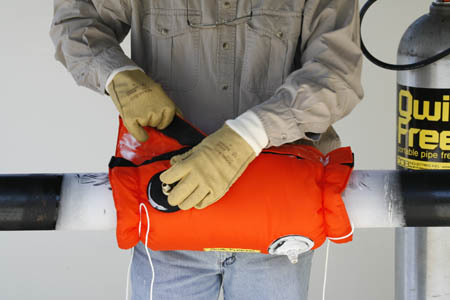 This temporarily isolates the water in the system and allows repairs or modifications to be made without draining down or shutting off systems. 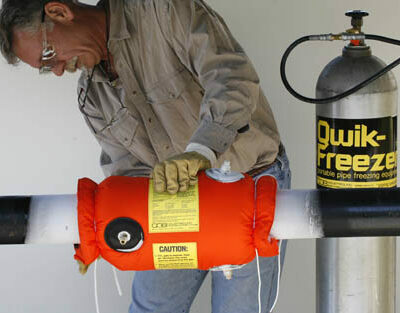 Qwik Freezer kits consist of insulating pipe jackets, CO2 cylinder(s), reinforced high pressure hose, fittings, insulated work gloves, a rubber mallet, safety glasses, operating manual, timing log and carrying case. QF 1500 Pipe Freeze Kit Pipe Freezing Kit for 3/8″ to 1-1/2″ I.D. 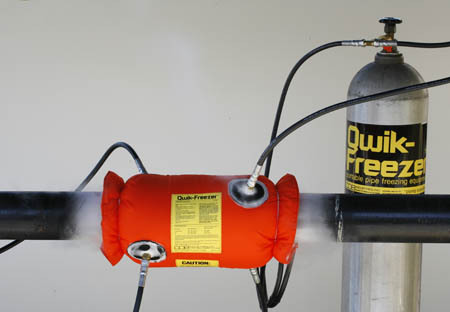 QF 1700 Pipe Freeze Kit Double Pipe Freezing Kit for 3/8″ to 1-1/2″ I.D. 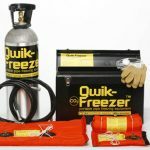 QF 2000 Pipe Freeze Kit Pipe Freezing Kit for 3/4″ to 1-1/2″ I.D. QF 2200 Pipe Freeze Kit Double Pipe Freezing Kit for 3/4″ to 1-1/2″ I.D. QF 3000 Pipe Freeze Kit Pipe Freezing Kit for 3/8″ to 3″ I.D. 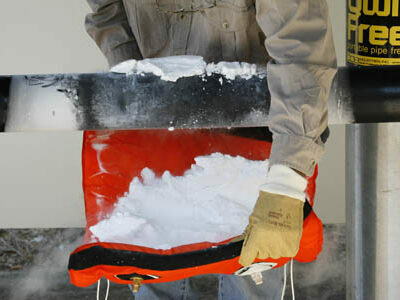 QF 3200 Pipe Freeze Kit Double Pipe Freezing Kit for 3/8″ to 3″ I.D. QF 4000 Pipe Freeze Kit Pipe Freezing Kit for 3/8″ to 4″ I.D. QF 4100 Pipe Freeze Kit Pipe Freezing Kit for 3″ to 4″ I.D. QF 4200 Pipe Freeze Kit Double Pipe Freezing Kit for 3/8″ to 4″ I.D. 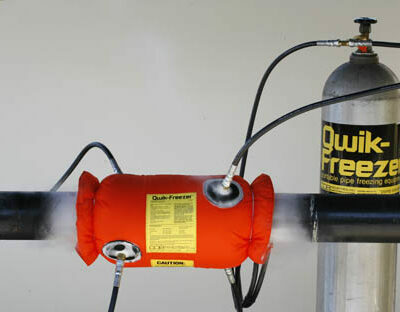 QF 4150 Pipe Freeze Kit Double Pipe Freezing Kit for 3″ to 4″ I.D. QF 6000 Pipe Freeze Kit Pipe Freezing Kit for 3/8″ to 6″ I.D. QF 6200 Pipe Freeze Kit Double Pipe Freezing Kit for 3/8″ to 6″ I.D. QF 6250 Pipe Freeze Kit Double Pipe Freezing Kit for 5″ to 6″ I.D. QF 8000 Pipe Freeze Kit Pipe Freezing Kit for 3/8″ to 8″ I.D. QF 8100 Pipe Freeze Kit Pipe Freezing Kit for 7″ to 8″ I.D. 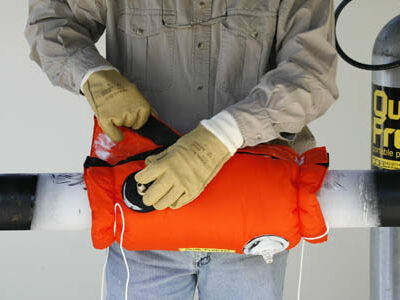 QF 8200 Pipe Freeze Kit Double Pipe Freezing Kit for 3/8″ to 8″ I.D.